We’ve just come back from an overnight stay at some friends’ farm at the base of the Glasshouse Mountains. What a beautiful view and spot to hang out, relax and for boys to be boys in some wide open spaces. As those who follow me on social media will know, I’ve been doing a raw food detox since January 1 and been feeling really great. Only in the last few days has it been getting harder, so I thought it was time to introduce some cooked vegetables and then last night some fish (barramundi). Roasted pumpkin & persian feta salad seemed like a reasonable segway back to normal! I’ll try to take it slowly with the reintroduction and keep most of my meals meat protein free, as I think that has been the main culprit to my bloating and digestive issues of late. Given my self-imposed food restrictions, I decided to take a salad to have with dinner, and this is what I made, roasted pumpkin & Persian feta salad – it was AMAZING! 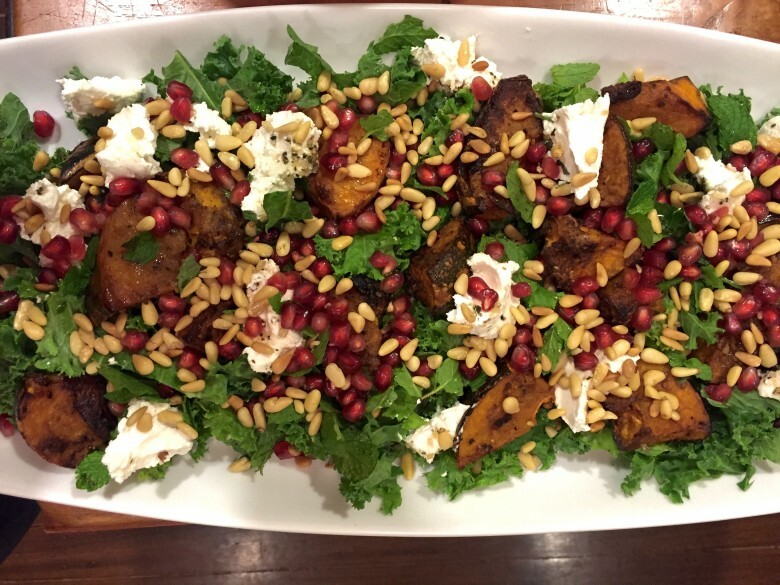 A delicious mix of roasted pumpkin, Persian feta, pomegranate and kale. Yes I admit I did have a little feta too which isn’t really part of the detox! It looks like a salad you could easily put on a Christmas spread with the green & red colours going on. The photos are a little dark as it was dark when we ate, so I apologise that they aren’t my best photos, the taste makes up for it, I promise! If you want to buy this spice, click here*. At one of my markets before Christmas, I had a stall next to a lady selling herb mixes from Your Inspiration At Home*. I got the Sri Lankan Coconut spice mix* I used on the pumpkin through them. 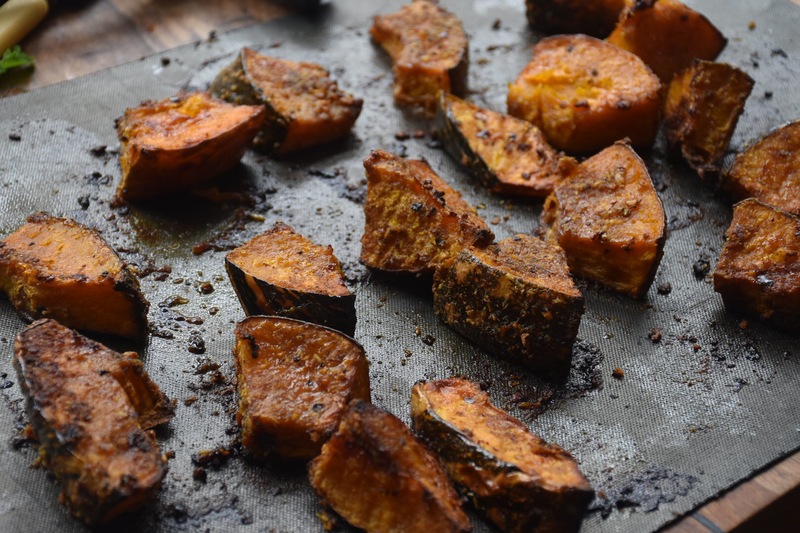 You could easily use a dukkha or a Middle Eastern spice mix, or even just salt & pepper. 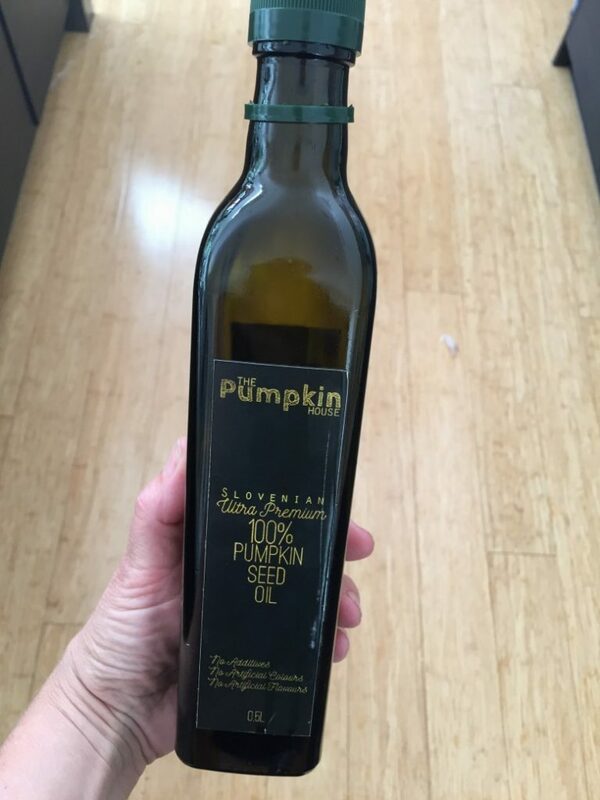 The markets were also my first introduction to pumpkin seed oil, through other stall holders, Veronika & Alex from The Pumpkin House Australia, a lovely Slovenian couple who have just arrived in Australia and are introducing us to their native speciality. Leigh and I are addicted to it and drizzle it on everything! It’s a really dark green and has a very nutty (pumpkin seed-y) taste. You can serve this salad with the pumpkin either warm or cold, I think at least at room temperature (rather than straight from the fridge) is a little better, but you could make it ahead of time and serve straight from the fridge. Delicious with any protein or on it’s own! This one is with the dressing on, never looks quite as good in a photo, but the taste is incredible. 1-2 tsp Sri Lankan Coconut spice mix (see link above to buy)(or spice of your choice) This one uses coconut, garlic, onion, turmeric, fennel, ginger, pepper, lime, chilli & salt to give you an idea of flavours. Toast the pine nuts in the oven at 160C for about 10 mins. Remove and cool. De-seed the pomegranate - the best way to do this is to cut it in half (around the middle, not top to bottom), loosen it a little by gently pulling the edges apart, then hold the half in your hand (seeds facing down) over a bowl and tap on the skin with a wooden spoon. The seeds will fall into your hand and through your fingers into the bowl. Keep hitting until the seeds are removed. Cut the pumpkin into medium sized chunks, leaving the skin on. Toss in oil (I use macadamia oil) and sprinkle with the spice mix. Roast pumpkin at 180C for about 30-40 mins, turning part way through. Remove once browned and cooked. Remove the kale from the stems and break into bite sized pieces. 'Massage' the leaves as you go - ie rub them in your fingers a little, as this softens the leaves a bit and makes them easier to eat. For the dressing, mix in a bowl: garlic, olive oil, 2 tsp persian feta, lemon & honey. Add a little water to thin it out if you need to. 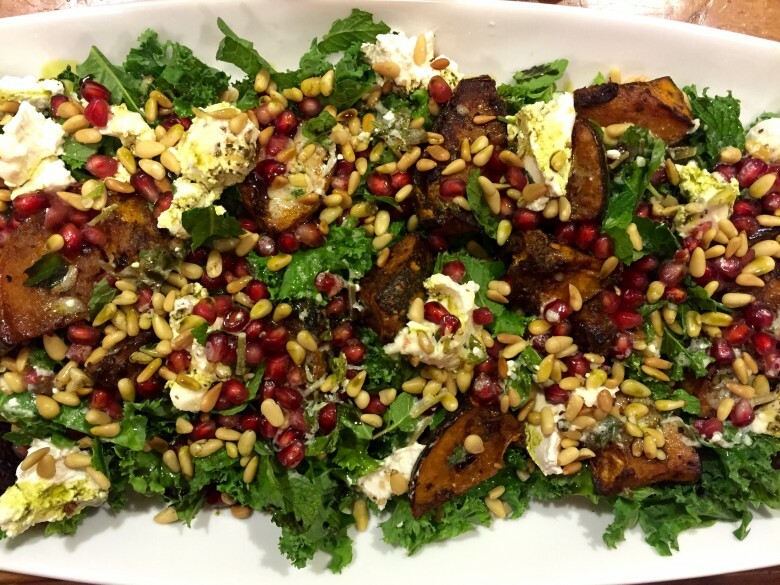 To assemble: lay the kale on a platter, place the pumpkin & blobs of feta over it, sprinkle with pomegranate & pine nuts. Drizzle with the dressing and pumpkin seed oil if you have it. *If you purchase this product from this link, I do make a profit. Try roasted baby beets as well. Just fabulous.